Career stats and power numbers aside, wondering why Wynn's wearing an airbrushed black hat? Topps used this picture because baseball cards are also a business--and one that felt pressure from two fronts in 1968. To compound things, collecting lore says team ownership either stonewalled MLB over use of the Astros logo for the late 60s or Houston itself balked at depicting their "Eighth Wonder of the World" (the Astrodome) without additional compensation. Less hard evidence exists for this theory, but their franchise changed names (from Colt .45's) in 1965 due to licensing demands from Colt Firearms, so it's plausible. Read You Can't Call Them ASTROS! at the Fleer Sticker Project for more info on that transition. 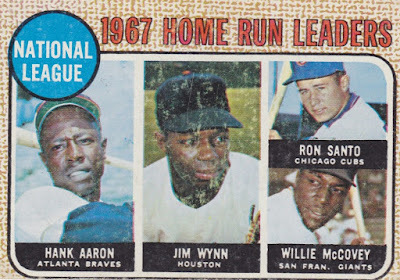 Short story, Topps went back to their archives for Jim Wynn's pre-1965 Colt .45's uniform...and then blacked out the hat. Business is business! 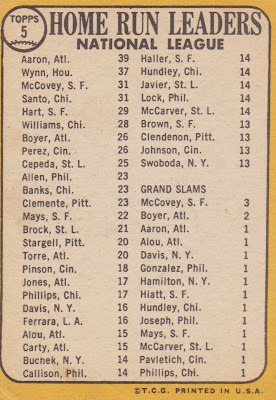 I like that Topps tracked each grand slam for 1968 and think the most dramatic blast belongs to Phillies rookie Rick Joseph, who pinch-hit a walk-off job in the 11th inning for his first career homer, beating the Dodgers 8-4 on September 16. MORE RICK JOSEPH FACTS: Joseph had an interesting talent for hitting from behind. 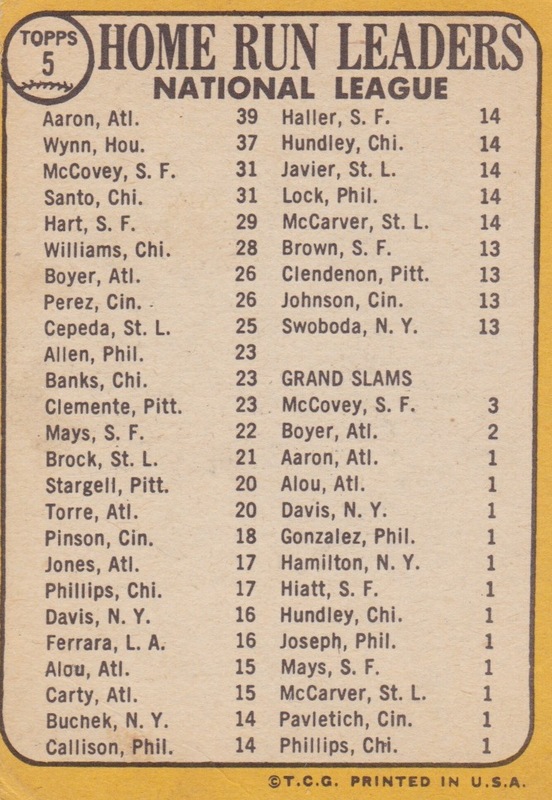 According to Baseball-Reference, Rick pinch-hit 6 of his 13 career homers and all 13 came with his team tied or trailing. Wonder who hit the most homers in MLB history with his team never in the lead? Value: Low-grade leader cards come cheap, even those with 3 HOFers. You can find this on eBay for about $5. Fakes / reprints: O-Pee-Chee did a similar version of this card with darker borders and PTD IN CANADA text; find scans in my 1968 set profile.